Selangor, Malaysia, July 14, 2015 - (ACN Newswire) - Migrant workers are more likely to report musculoskeletal pain when exposed to dust and unreliable equipment, say Malaysian researchers. In 2007, migrants represented approximately one sixth of Malaysia's labour force, a rise of 9.4% from the previous year. Most of these are overworked low-to-medium skilled labourers receiving low pay, and are being used to fuel the country's rapid economic growth. Foreign labour is in high demand in Malaysia, as local workers tend to avoid low-wage jobs with poor environmental safety measures. Musculoskeletal disorders (MSDs) - a wide range of injuries and disabilities that affect the body's movement or its musculoskeletal system - are influenced by a variety of factors. These include the more obvious physical factors, such as carrying heavy loads. Psychosocial factors, such as stress and working night shifts, can also lead to MSDs through behavioural changes, such as altering posture to avoid discomfort, creating further risk for MSDs. Few studies have looked into the role of the physical environment of the workplace in relation to MSDs. 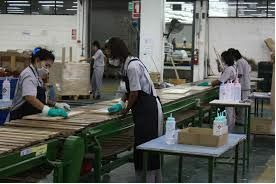 In a study published in the June issue of the Pertanika Journal of Social Sciences & Humanities, researchers from the University of Nottingham Malaysia Campus surveyed 317 migrant workers in Malaysia's manufacturing industry. The respondents were from Sri Lanka, Indonesia, India, Nepal and Myanmar, with an average age of 28. On average, they worked 12-hour-long shifts per day. Two thirds of the workers reported musculoskeletal pain that was either caused or made worse by work in the last 12 months. Interestingly, workers who said they were exposed to dust were almost six times more likely to report musculoskeletal pain than those who said they were not - in previous research, exposure to dust has been listed as a predisposing risk factor to MSDs. Also, those who expressed concerns about the reliability of their equipment were twice as likely to report pain. Similarly, those who said they were under pressure to meet work demands or had long or unsociable work hours were also significantly more likely to report musculoskeletal pain. Among the psychosocial factors addressed in the study, pressure to meet work targets showed the highest correlation with MSDs, leading the researchers to recommend further examination of this relationship. They also recommend examining the roles of other psychosocial factors, such as organisational and safety culture and relationships at work, in musculoskeletal disorders. Due to the nature of the study, a clear causal relationship between work factors and musculoskeletal pain was not possible to establish. Future studies should look into this relationship, the researchers say.